A very small trailer sits to the side of a sizable field of crops to the east of it. 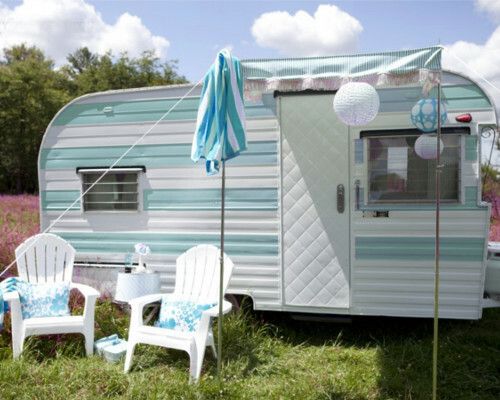 A green and white striped camper trailer. A single white door is a quilted metal in a diamond pattern. A few small windows are several strips of glass that tilt and open when a lever is cranked. The interior of the trailer is cramped and made even smaller by the curtain of green beads partitioning the space. Fortunately, the smaller part is the deepest in and contains merely a raised bed with cupboards built in underneath it. In the main area, along each side wall are cushioned bench seats, adorned with many green striped pillows. One bench is shorter, to make room for a small camp stove. Colorful green striped fabrics drape the windows and several nooks and crannies, and the floor is made plush by several overlapping rugs.